Sure, the pay is great, but hitmen do not have any benefits. You have to build your nest egg without any matching contributions and your medical is 100% co-pay. These things start to matter when you get to be Asher’s age. He doesn’t think he is going anywhere, but his body is not so sure in Michael Caton-Jones’s Asher (trailer here), which opens today in New York. Frankly, Asher would not have lasted this long if he were not so lethally effective at his job. However, his latest assignment got a little complicated. A hot day combined with an out-of-order elevator leads to a fainting spell he recovers from in Sophie’s apartment. Of course, she has no idea he is there to kill her neighbor, but his gruff, socially awkward behavior will make her think twice when he returns to ask her out. Nevertheless, she is curious enough to eventually accept, at which point they start to click. Arguably, this is the perfect time for Asher to get serious about a relationship and ease out of the business. His former protégé has been getting all the really choice contracts lately. However, it hard for a cat like Asher to change his ways. Unfortunately, that also means Sophie could be at risk when a dodgy assignment he was talked into taking turns into a full-blown vendetta. Asher is a relatively small, unassuming film, with a little bit Tarantino style action, but it works on its own level. In some ways, it could be considered Ron Perlman’s Gran Torino or Harry Brown, in which he contemplates his own mortality within the sort of off-center genre film that he is certainly no stranger to. He was probably born to be Asher, but he plays the part with surprising restraint—and even a little bit of soul. Famke Janssen is also terrific as Sophie, portraying her as smart, seductive, and vulnerable, as well as a little naïve. She and Perlman develop some pleasantly easy-going chemistry together. On the other hand, it is depressing to see Jacqueline Bissett cast as yet another dementia-troubled mother. In fact, the side-plot involving Sophie’s mom Dora threatens to drag the film down the same unrewarding narrative path as Grace Quigley (Katharine Hepburn’s final big-screen star vehicle), but Caton-Jones pulls it out of that nose-dive. In fact, Caton-Jones has the right touch for this material, maintaining a vibe that is dark and serious, yet somehow also light. Despite all of Asher’s brooding and seething, the film moves along at a spritely tempo. This is not a monumental cinematic statement, but it is an entertaining (yet surprisingly honest) film that Perlman’s fans will particularly enjoy. Essentially, it is grittier than The Hitman’s Bodyguard, but more humanistic than Schneider vs. Bax. 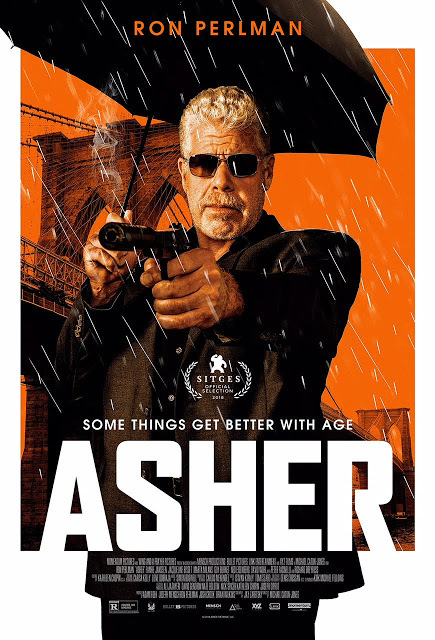 Recommended fans of Perlman and hitman comedies, Asher opens today (12/7) in New York, at the Cinema Village. The Charmer—What’s it All About, Esmail?